Hey, Dave, long time no talk to! Ready to record an update? I found something damn interesting in regard to your photo of that strange critter on the NIDS ranch. Take a look at this animal in the first link. Note those hindquarters and tail. If it crouched, it'd be a dead ringer. And in the second link, scroll down to picture set 2 and you will see another creature crouching just like the one in your picture. This little critter is out there, seems like. I have had a guy look for this thing in Walker's Mammals of the World, and it just isn't a recorded species at all. Sorry for the delay in responding,... I've been real busy! and way behind on emails, updates. 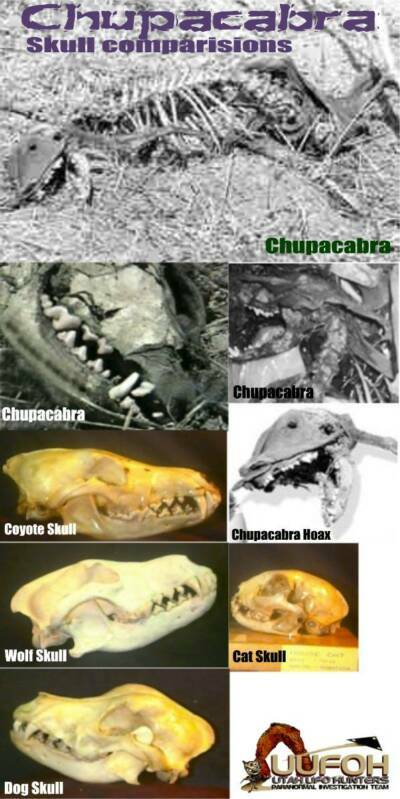 I checked out the links on the unknown animal and yes I would have to agree, the color and markings and size seem to be the same. I put together a photo comparison using the photos from the links you sent. >below< "Chupa-kitty" let me know what you think. "coy-dog" creature is still unexplained. 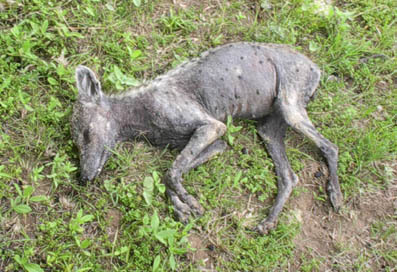 Another unknown animal with similar characteristics, this one is "hairless"
l Elmendorf Chupacabra Really A Deer? The great debate continues over a strange animal shot and killed by a farmer in Elmendorf. A San Antonio hunting guide says he has the answer. 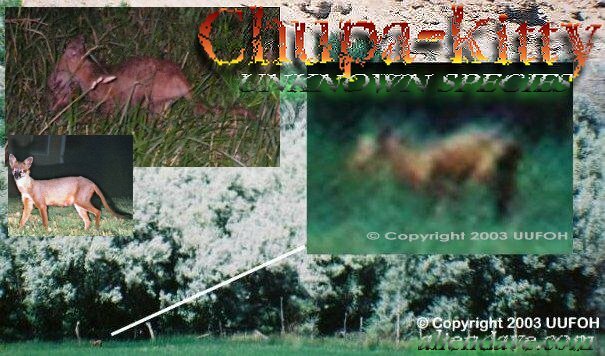 < Unidentified animal photographed by Devin McAnally about six hours after he shot the creature, no blood. Described as about 20 inches tall, 30 inches long with 3-inch-long, thin, fangs that extended downward from upper jaw and overlapped with 1.5 inch fangs protruding upward from lower jaw. (Not visible in photos.) 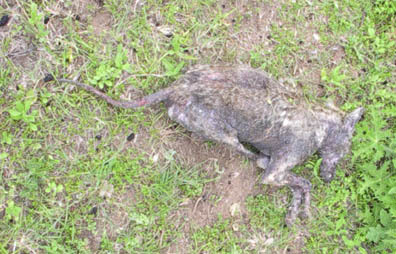 There are spots on the hide and sparse hair as described by eyewitnesses in Puerto Rico of the alleged "chupacabra goat-sucker" there. Digital photograph © 2004 by Devin McAnally. © 2004 by Devin McAnally. Hello, I'm an exotic animal nut and go to many auctions, I believe the animal in the photo is a muntjac. 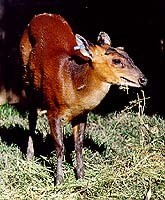 Muntjac are small and appear noticeably hunched forward. Whilst their raised hindquarters give the impression that their front legs are shorter, this is in fact not the case and all four legs are proportional. When moving Muntjac will hunker down and run with head low and tail raised, although the latter is more usually associated with fright or mild alarm. In flight Muntjac have a barrel-like appearance and they can often be mistaken for foxes when seen in poor light or dense cover. A mature animal may reach a height of 43-46 cm at the shoulder and weigh between 11 and 16 kg, the females (does) being slightly smaller. I thought they were cute and almost bought one but found out they have large fangs and can be quite aggressive although they only weigh about 30 to 40 lbs. It is what we call in the UK a young 'muntjac' deer. The adult measures around 45 cm at shoulder. I have come across very young ones in our local woods, they are tiny. 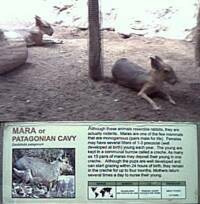 While researching what this animal could be, we came across this small animal known as a 'MARA' or 'PATAGONIAN CAVY' which fits the small size frame and has that deer-like look with a kangaroo-ish snout. It looks somewhat like a rabbit but is actually a rodent. The Windigo or Skinwalker decided to take this shape while we were present. 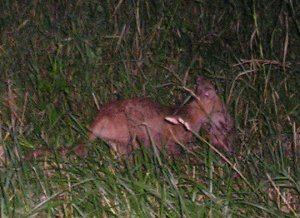 I seen this photo of this strange little animal.Given the size of it,my best guess would have been a baby kangaroo. I say this because of the high back and longer rear legs.The fact that it is walking on all four legs is what makes me think different. Muntjac Deer Facts-Rolling Hills Zoo http://www.deer-uk.com/muntjac_deer.